Executives today handle more risk and stress than ever before. Their roles include complex decision making with multiple variables with nuanced consequences. Maintaining focus is difficult in modern, complex, and constantly changing organizations. 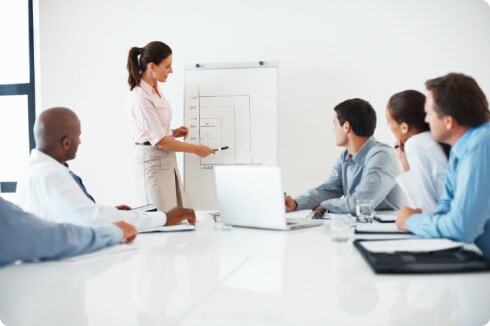 Employee Development Systems, Inc (EDSI) executive coaching programs can help senior managers do more with less, and wade through the morass of choices and risk to get the clarity that helps them lead with greater confidence and success. Unless your company is just hiring leaders from outside versus developing their own. Most companies have a strategy that combines the two options of fostering leadership from within and hiring specific skills from the outside. Either way, it is simply sound management to make sure the leaders that are brought up through the ranks are agile, competent, and can handle any challenges that are coming their way. The most common reason for employee exodus is a bad manager, and that makes executive coaching a practical investment. It makes financial sense to ensure that your managers are highly competent, are able to communicate to manage performance and are personally effective. Assumed competence is dangerous. Just because an employee was a great team member, we may assume that he’ll seamlessly fit into a new leadership role. That assumption will result in failed promotions and the loss of star players. Decreasing or canceling management training programs entirely is simply a risk most companies would not take, if they thought through the chance they’re taking by throwing people into new positions without the tools they need to be successful. Well-developed managers and leaders build productivity and profits. Leaders with a developed understanding of behavior styles, flexing styles to achieve effective communication, organizational effectiveness, and active listening, are the backbone of your organization’s success. How can we let that critical piece of the success puzzle be left up to chance? Various studies show that if you invest in human assets you can increase productivity by 5.2%. Overall company productivity would increase by 21%. ROI of investing into leadership and management-Leadership and management are the major driving forces of any company. They determine the overall company performance and profits. According to Forbes.com, you can boost your company-wide profit margins by 47% and can experience 86% better company value. Companies that invested in leadership development such as executive coaching programs are amongst the top most admired companies list in Fortune 500 Companies. Make sure your organization is adopting the best practices of these most admired Fortune 500 companies! EDSI helps senior managers develop the crucial skills that will allow them to achieve superior individual and organizational performance. Programs such as Communicating to Manage Performance, Leading with Credibility, and Working Successfully in a Changing Environment are a few of the programs that have helped develop many executives in Fortune 500 organizations, for over 30 years. Contact us to learn how we can help increase productivity and profits in your organization: 800-282-3374.